Today's review is for the book Night. I actually read the whole trilogy of these books - Night, Dawn, The Accident (or as it was renamed - Day)- because in all those three are only 300 pages. 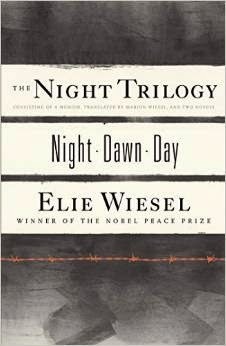 This book is actually a true story of the author - Elie Wiesel. (He won the Nobel Peace prize in the 80s). It is a story of his survival as a teen in a concentration camp in Auschwitz. It starts with how they are taken from their homes, and moved to the concentration camps. How they had no idea where they were going or why. As a teenager, he didn't know what to think - just that he didn't want to get separated from his father. Elie spends the whole time he is in the concentration camps with his father, until his father succumbs to an illness and dies. He never sees his mother and sisters again. He does escape the concentration camps but never really gains a life. He spends his life constantly remembering what happened to him and in a constant state of believing he did not deserve to live. The story is depressing to say the least, and gets more and more depressing through the third book. But if nothing else - read the first one- Night. The story is amazing. It is always hard to read stories of people who recount their time in the concentration camps. How they ate snow to stay alive. How much they walked. How little they were cared about. You never get less angry about their situation no matter how many times you read about the Holocaust. There was a quote at the end of the book that I liked "I was once more struck by the truth of the ancient saying: Man's heart is a ditch full of blood. The loved ones who have died throw themselves down on the bank of this ditch to drink the blood and so come to life again; the dearer they are to you, the more of your blood they drink." A little morbid? Maybe. But it is very true. Made me think of my grandmother - she is in every part of me every day to the point that tears still come when I think of her and how much a miss her. This quote speaks to me about the hole loved ones leave when they die. I give this book 4 1/2 stars. I loved Night and liked Dawn - the second book. I didn't really like "The Accident".